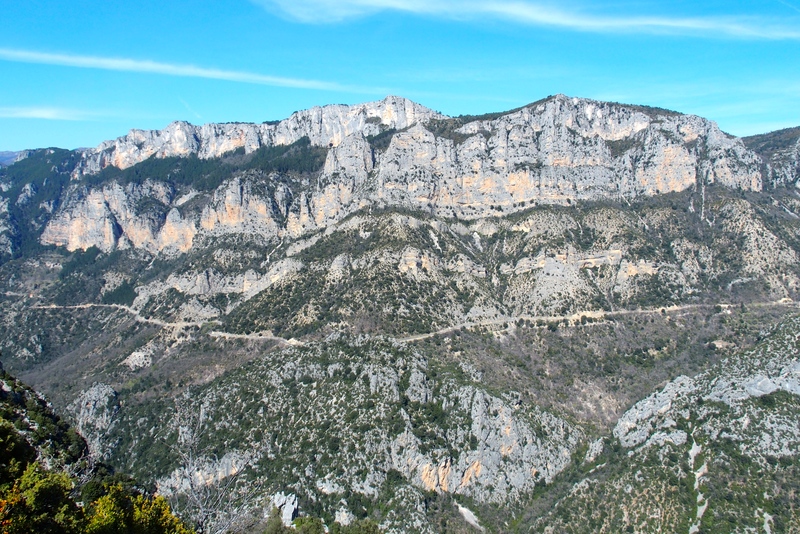 Les Gorges du Verdon is France’s version of the Grand Canyon. There are a number of similarities. In both cases, a relatively small river has etched its way through several thousand feet of limestone, leaving a wide gorge with walls of colored sedimentary stripes. 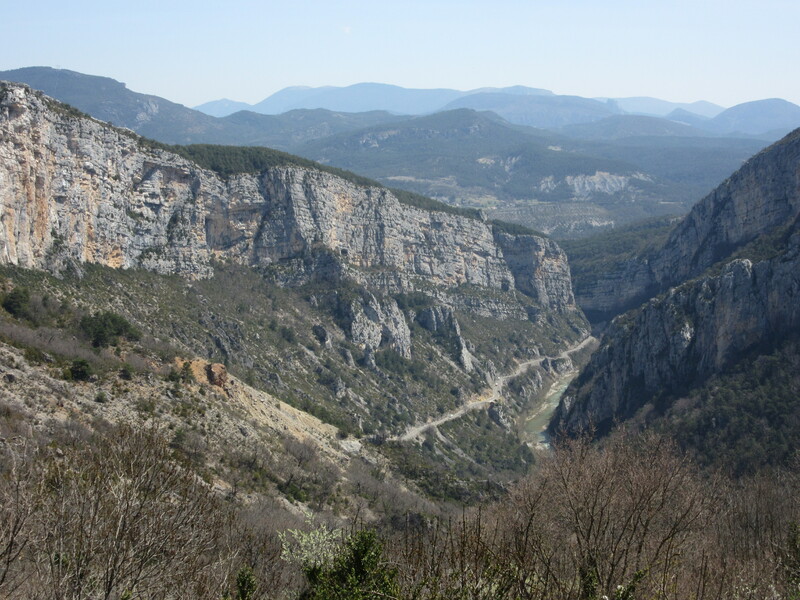 Note the small trail of blue-green, the Verdon River in the valley of Gorges du Verdon. 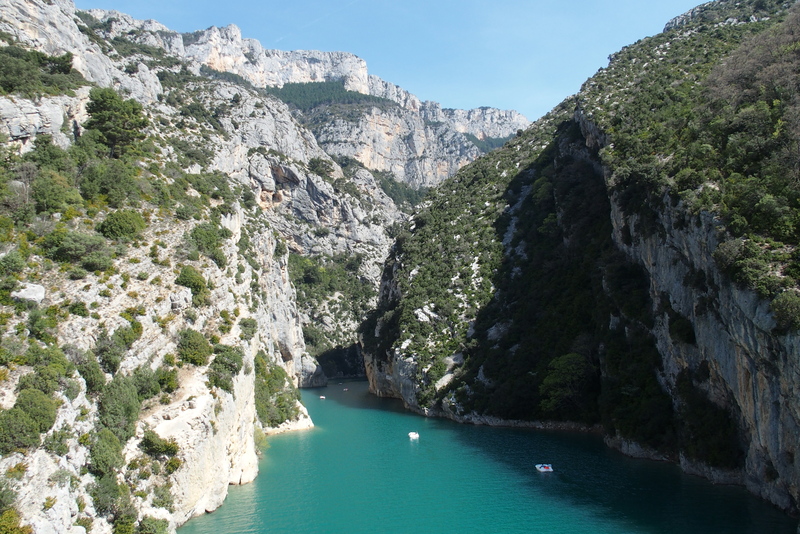 Gorges du Verdon means gorge of the Verdon River. 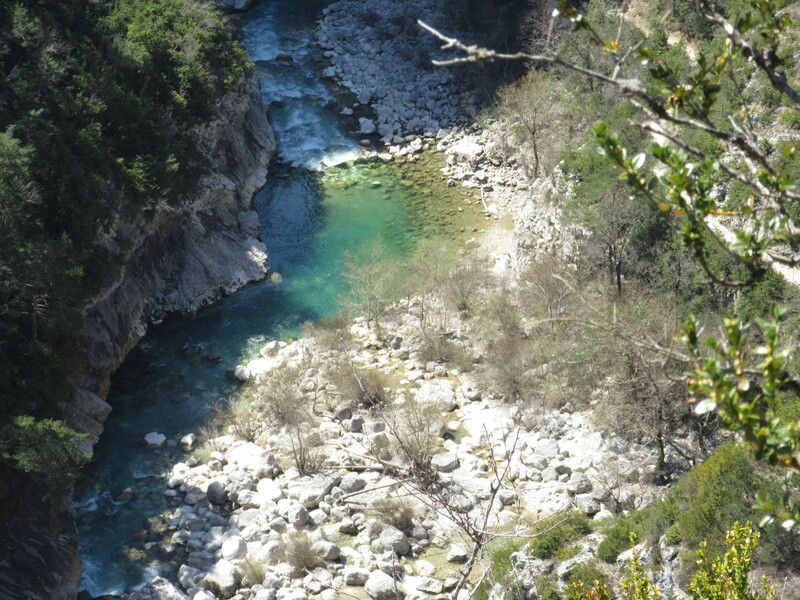 The word Verdon plays on the greenness of the water. Its similar to the blue-green of the glacial waters we’ve seen in the US, Canada, and New Zealand. Here the river is fairly narrow and shallow, up to 2,000 feet below the top of the gorge, and slipping underground at times. The drive around the gorge allows access close to the river level, quite a bit closer than our views from the top of the Grand Canyon in Arizona into the gorge a mile below. This tiny river has done a lot of work eroding the rock to make the canyon. 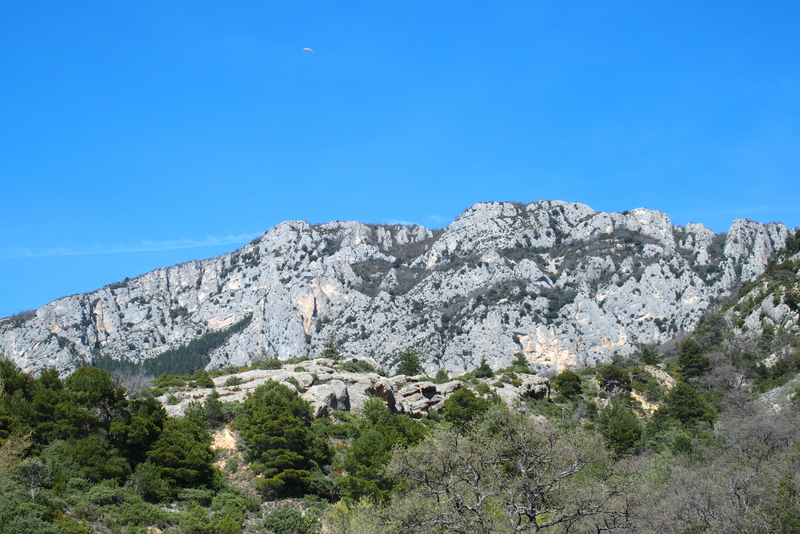 Just as the Rockies were formed by geological uplift, this area of Provence was lifted out of the sea to form mountains. Note the pitch of the layers in the rock behind Michael below. Plenty of walking paths and climbing faces along and above the river. Surprisingly, these rocky expanses are full of trees, shrubs, and even flowers. Early spring flowers growing out of…rock. The whole path is lined with wild thyme, with a lovely smell. And the views are spectacular. In mid-April, there is still a little snow on the peaks. In the mid-1970s, the river was dammed to provide electric power and a water supply. 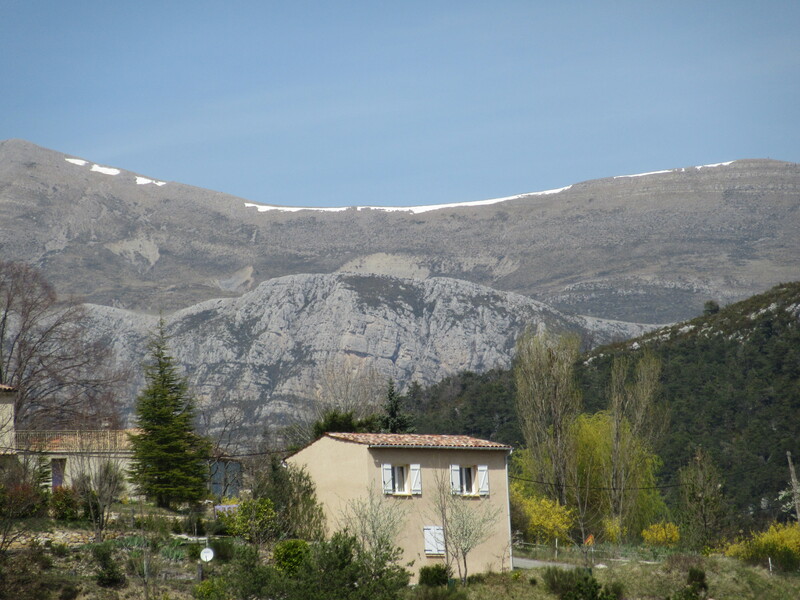 Water covered the small village of Salles sur Verdon and the residents were removed to a new village on the hillside. 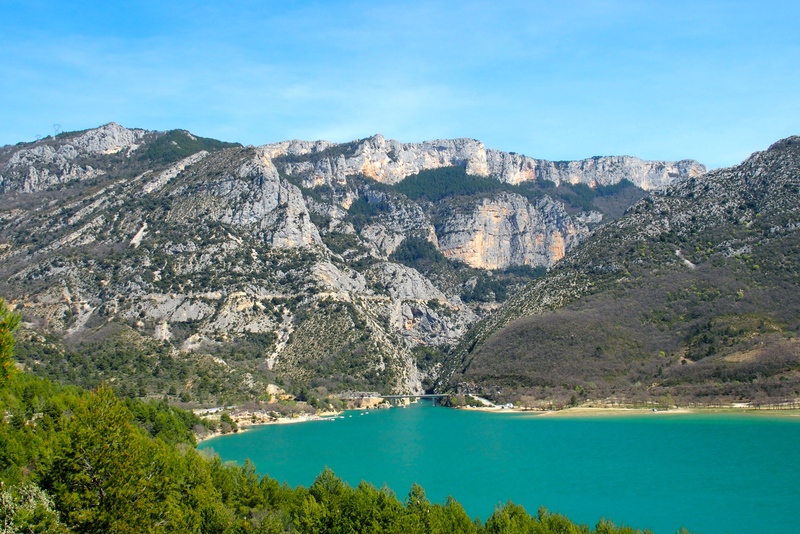 The result was the beautiful blue-green Lac de Sainte-Croix. Taking a photo of his loved one in front of the scenic view of the lake. Just as important as its utility uses are the lake’s tourist opportunities. Boating is popular, but only electric or human-powered. Beautiful, sunny day. Perfect for a pedalo ride. The Pont de l’Artuby is popular for bungee jumping (Saut à l’elastique). 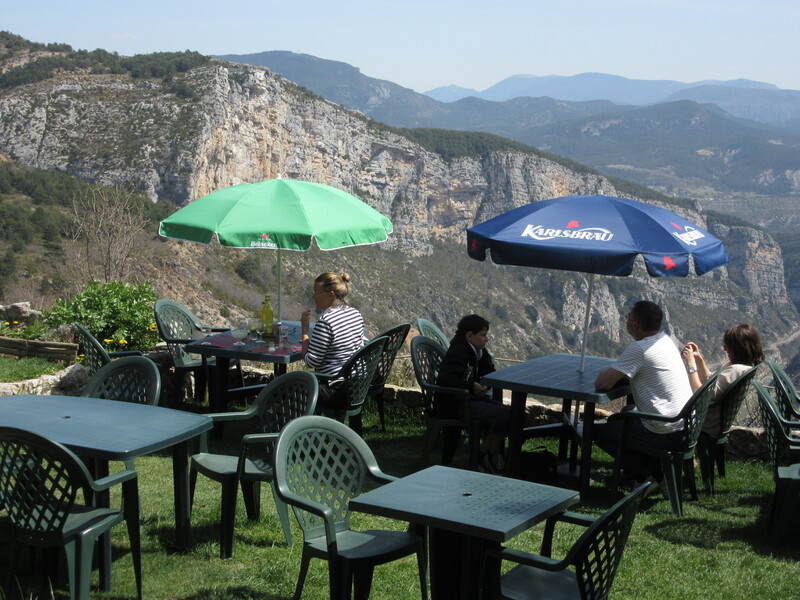 In the Haute (high) region is the tiny town of Rougon, with a population of 114 people, an unknown number of goats. 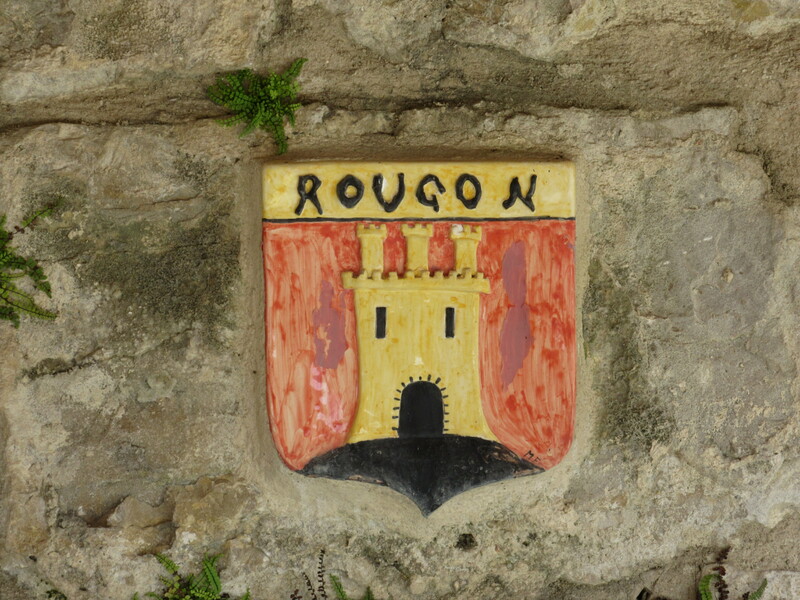 Rougon, a tiny town on the top of a mountain. Person number 65 created this shield for the city. 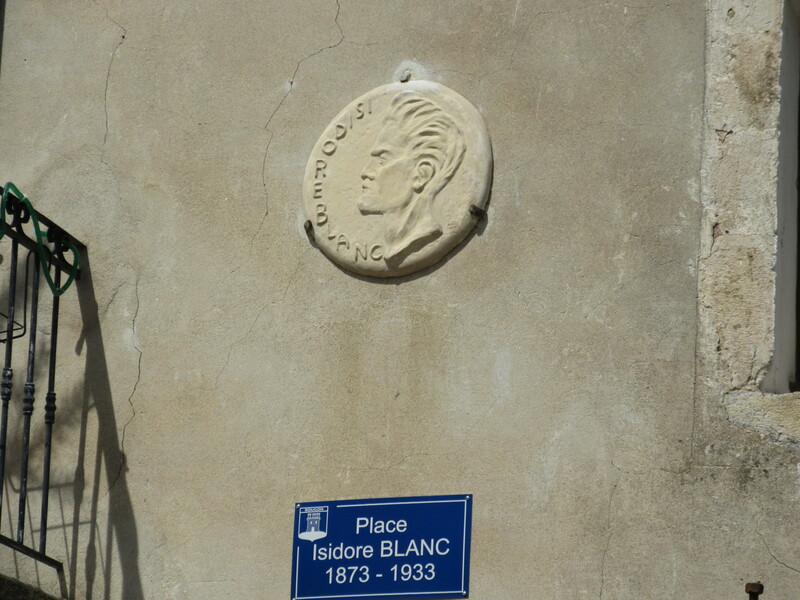 Isidore Blanc is one of the men credited with first exploring and charting the full Gorges du Verdon in 1905. He’s honored at several points on the trail and here in Rougon where he was a schoolteacher (when the population was more than 300). Stone, wood, and flowers, a Rougon doorway. 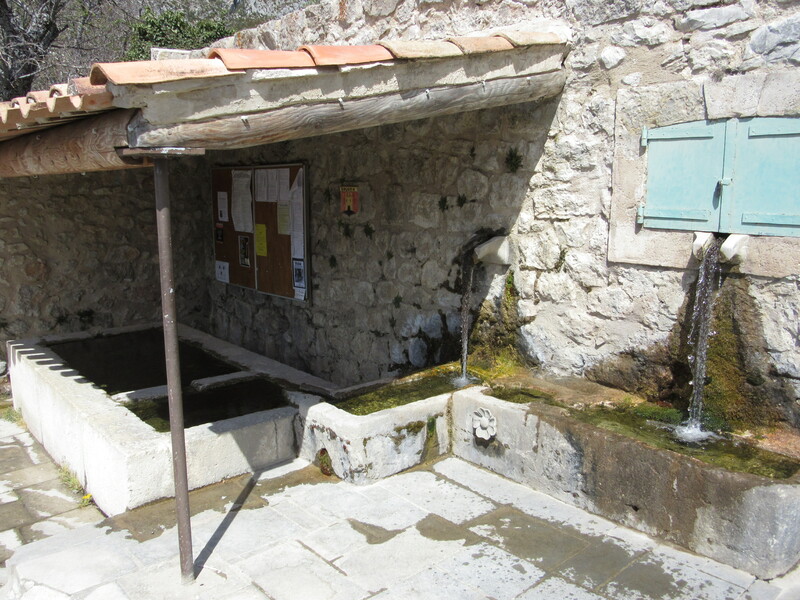 The “lavoir” is one of Rougon’s main attractions. It’s a great spot to wash your clothes. With only 114 people in the town, we didn’t know if we would find a restaurant or at least one that was open. Then we stumbled on a creperie known as Le Mur d’Abeilles, the Wall of Beeboxes. 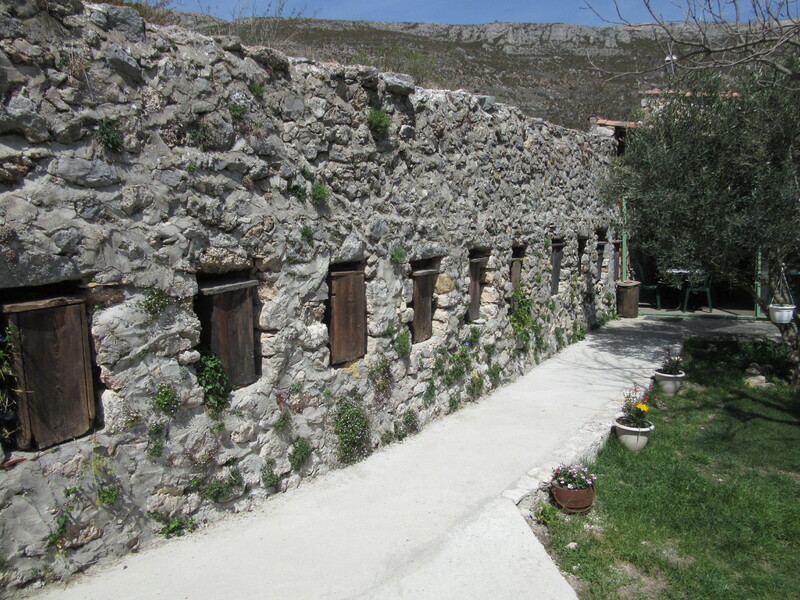 The little boxes were once used for keeping bees. We couldn’t beat the views. Birds of prey soared over the valley. How many ridges can you see? So relaxing in the sun on the mountains. 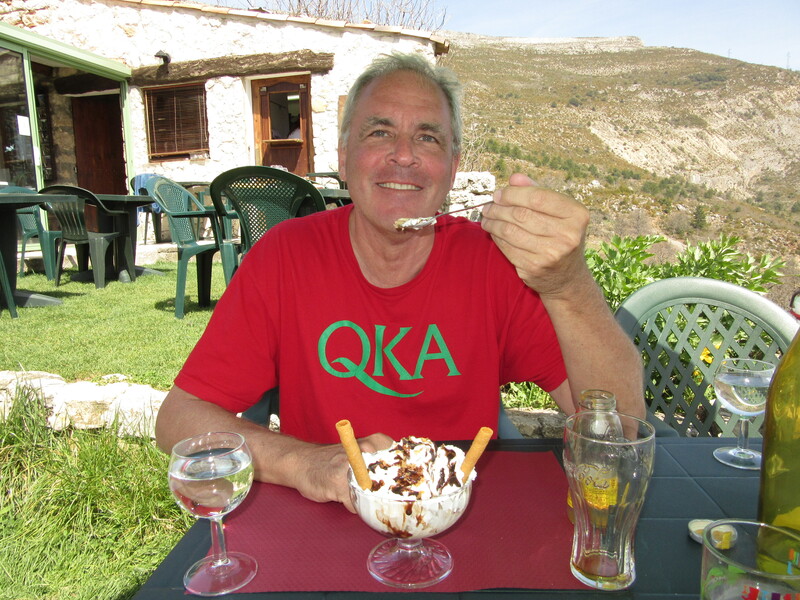 Michael is “having a moment” with his ice cream break atop the mountain. 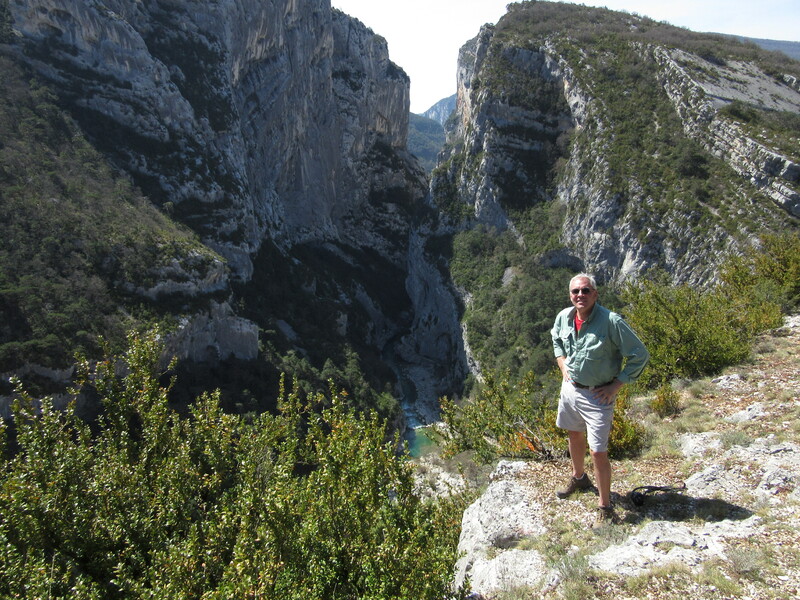 This entry was posted in Smell the Roses, Travel Journal and tagged France, Gorges du Verdon, Isidore Blanc, Lac de Sainte-Croix, mountains, river, Rougon. Bookmark the permalink.